Winning football matches away from home you say? Well yes please. Although perhaps we could work on making it a little bit easier for ourselves by actually doing it without brain farting our way in to conceding goals and having to rely on our forwards to do the business each week, eh? From the first few minutes we were nervous in defence and when Petr Cech is gifting opportunities to rival teams from the first few minutes, it’s always going to be a harrowing watch for us all, isn’t it? His pass straight to Harry After showed us what we already knew – he’s not a ‘keeper who will last in this team long term – and what’s more worrying is that better teams will take their chances and we all know what opponents will do to press us higher up the pitch. If any opposition manager doesn’t tell his team to go out and press us high up the pitch then he’d be mad and Neil Warnock did just that from the start of the first half and the second half too. After about ten minutes in both halves the game settled in to the usual possession dominance that we’d expect and I thought Arsenal were good value for the win in the end, but when you’ve got a team so goal-shy as Cardiff getting two and putting us under pressure and not sitting back, you can tell we have a blueprint for teams playing against us all season. I expect Newcastle will do the same at St James’ park in two weekends time. The fact we took the lead in 11 minutes should have led to a dominant display and when Xhaka whipped a ball in for Mustafi to nod home I had hopes of watching a nice, easy, afternoon’s entertainment whilst on holiday in the Algarve. Sadly this is Arsenal and as we are all beginning to realise this season is going to be fraught with defensive lapses. Xhaka had a decent game and played ok in the most part, but his cross-field pass was poor and whilst I understand he polarises opinion, his lapses in concentration frequently cost us goals. He makes high profile mistakes and whilst we need him for so much of our build up play and generally having the build up through him, until he cuts out those mistakes there will always be people who lament his inclusion in the team. But despite that poor pass, there were more mistakes in the concession of our first goal, particularly Monreal who did absolutely nothing when turned by the Cardiff scorer. Arsenal Football Club, giving small teams hope since 2011. 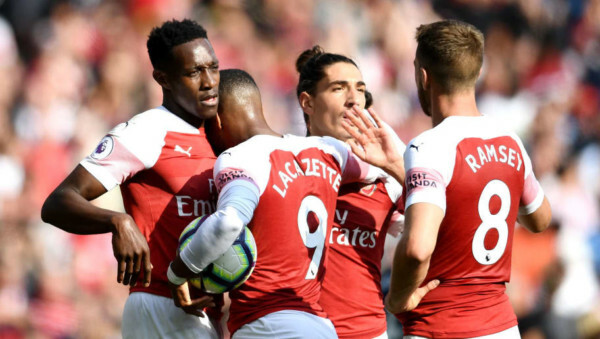 It came at an annoying time and just on the stroke of the half, which might have contributed to our nervy start to the second half, but we quickly settled in and Aubameyang’s goal was a thing of beauty because it was the type of Arsenal goal we used to see years ago. Ozil – very quiet in the first half – was involved and whilst he was a peripheral player like Auba in the first half, both were better in the second. I said to The Wife’s uncle, who was chaperoning me for the day in the bar, it feels like we have to work really hard to get our goals and that was an example of a well worked goal that came from the attacking players class and guile. But the flip side of that is that whilst we have to work so hard for a goal, it feels like we gift opponents chances too easily, which was the case for their second equaliser. The ‘foul’ in the build up to the goal was an absolute joke though. Lacazette clearly didn’t touch Arter and in classic British commentator fashion the two guys commentating said that it was ‘soft’. No, it wasn’t soft, it was a dive. Simple as that. English players don’t dive, eh? Well here’s a perfect example of one that has, and Harry Arter played his part in cheating Cardiff level. Again though, the goal was still preventable and we should have dealt with the first header back towards goal and also the header from Ward in off the post. We had a line of Arsenal defenders nowhere near Ward when he headed goal bound and picking up markers – a simple instruction in football – should be absolute bread and butter for a top flight team. We responded though, thankfully, and it was man of the match Lacazette who got the winning goal. He simply has to start now. He held the ball up well, he took his goal well, picked up an assist and the relationship between him and Aubameyang is there for all to see. Play them both and we’ll get goals. From an individual performance side it’s worth noting that Ramsey did ok I thought and busied himself all afternoon. Guendouzi looked ok but also gave the ball away a few times and I think we need to think about getting Torreira in for him, because his introduction calmed us all and he had a very effective 30 minutes or so. Get him alongside Xhaka and Ramsey and let’s see how we get on against Newcastle. It’s a bit of a break now and there’s clearly some work that Emery needs to do defensively so my hope is that there is plenty of analysis on us at the back because we need to improve. But we’re off the mark away from home and that’s he important thing.